There isn’t much I remember when I was younger than 7 years old, but one of the most vivid memories I have is walking the rows of my grandfather’s 1 acre garden in downtown Harbor Springs. I would go over many days and spend days with him and we would pick veggies, tend to the garden, and he would have me sample things we picked. I remember biting the heads off the broccoli whenever he turned his back and laughing when he found me out. I loved his garden so much so that he was ultimately the reason Hayes received William as his middle name. I couldn’t imagine a better way to pay homage to a man who unknowingly sparked my love for plants and seasons. I wanted to somehow pass along his passion for gardening and living simply to Hayes. Even if he will never know him, Hayes will grow up experiencing what my grandfather sowed in me at a young age: A love the garden. That said, the garden has always been a passion of mine. In 2009 after I finished school and moved back home to my parent’s home (thanks to the recession) I spent much of that year helping my dad start their garden. I learned from him and him from me. Then when we rented that home from my parents for a while, I kept it going. In fact one year Mike and I got brave and hand-tilled it ourselves. Not the smartest thing we have ever done. That 60×40 inch plot was a labor of love and I learned a lot from that garden plot. You can read a few posts here and here from WAY back about what I was learning. Now, that we are back in Michigan, I am taking what I have learned during those years and starting our own farm (yeah I am going beyond a garden) on our land this fall. In the meantime, though I will be setting up a small garden at our rental for our friends we are renting from. My hope is the garden will help feed them and keep their daughters busy while they welcome their third child this summer. I will also be spending a few hours a week volunteering at a local farm to learn even more so I can build a successful acre (eventually) garden of our own. My goal before 40 was to spend more time with my hands in the dirt than at the computer. I love what I do, but I love the garden even more. Since we are now entering spring, we will be sharing a lot of gardening talk. We will discuss what will be local in your market if you cannot grow things or just want to fill in the gaps for yourself and how you can support your local farmers more. We will be giving you tips and views into our own farming journey as well. 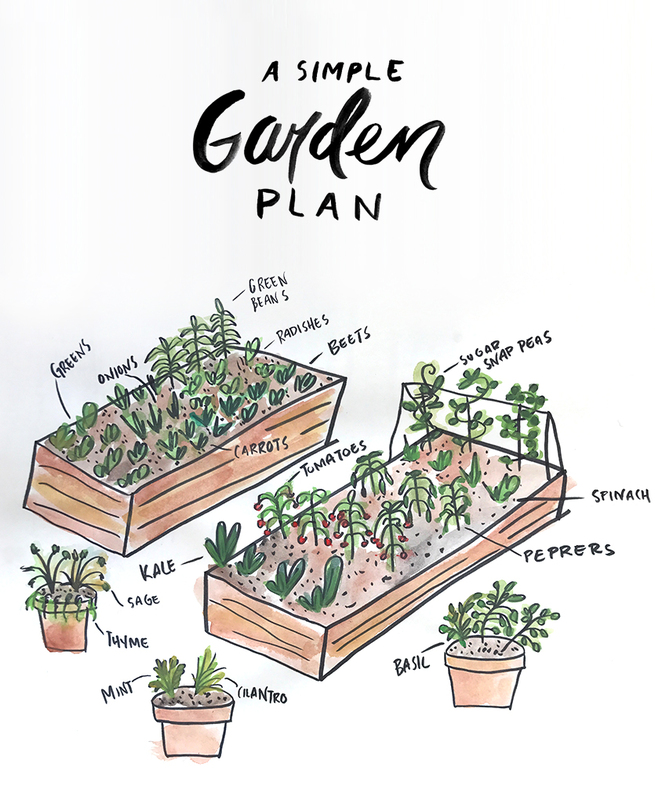 To begin, I thought I would design a simple raised bed garden plan for any of you who just want a simple at home garden or if you are just getting started with gardening. What I like about this plan is that even if you live in an apartment you can take pieces of it and add them into your lifestyle and cooking routine this year. You can check here, but you should know this because this will help you know when to plant each vegetable. Most seeds come with info on the packaging that tells you when to plant based upon your zone on the plant hardiness scale. For instance, we live in 6a. This means we cannot plant until after May 15th or at least not leave the plants out uncovered. I would suggest growing things you know you will eat. You will find more joy in growing them when you can pick them and cook food you enjoy. 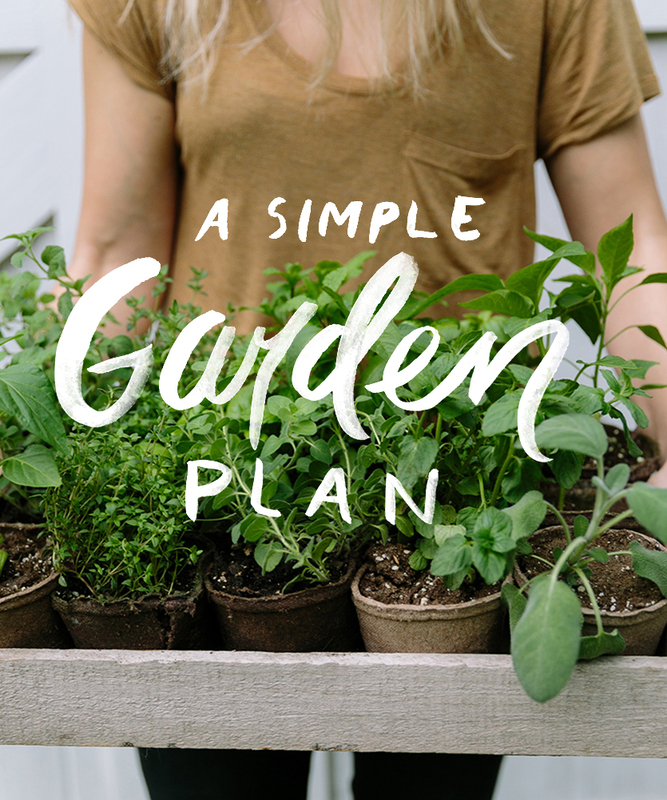 The plan I have put together is perfect for anyone with a small yard in a city to someone living on acreage in the country but wants to have their first garden. If you don’t have a yard then you may want to consider doing something in your windowsill or in pots in your apartment. If you are in an apartment or only have a stoop or patio for growing, I would suggest using a container system and grouping veggies by their growing season (more on that below) so you can clear that container and add in later harvest veggies or hearty vegetables that you can pull before winter. If you do have a large enough area, read on! This plan is perfect for anyone wanting something easy to maintain and/or just starting out. 2 4×8 raised beds. You can buy them here or we will be sharing a DIY this season for you to use as we get closer to planting. If you decide to just place the garden in the ground you will need to get your soil tested which you can do with a kit like this or use your local Agriculture Extension. We have our’s through Michigan State University, but most every state has a similar service. 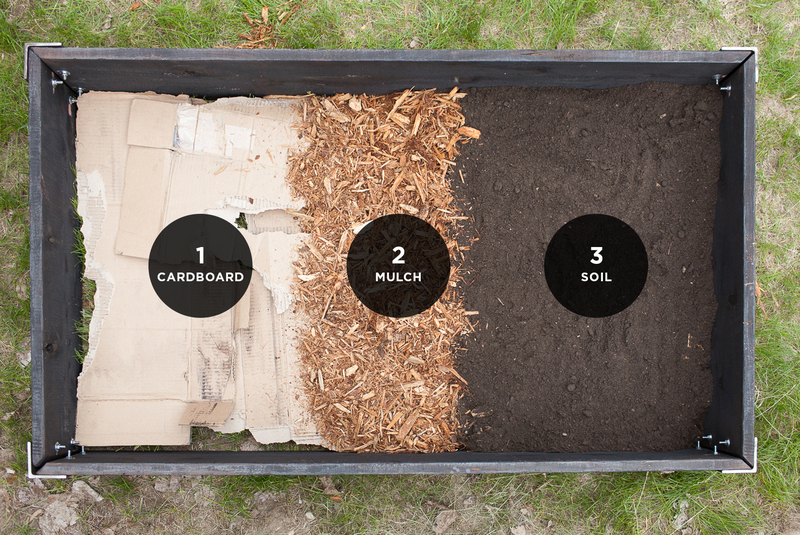 Setting up your raised beds is easy, but to layer the cardboard and mulch within your raised bed, you can use this graphic we did from an older post to help you out. Now, let’s get to that plan! This plan isn’t to scale and you will have more than just three pepper plants, but this gives you a rough layout to work from. You will need to read your seed packages and so on to know how you should space your plants. Whether you grow your own plants from seed or pick them up at a local garden store, there will be instructions on how to plant them properly so make sure to read those directions. Every plant unless it is a perennial has a lifespan where they go from seedling to seed. Certain plants can be planted earlier in the spring and then others do better to start later in the summer and harvest before or after the first frost. So, I tried to clump things based on this. That said, the greens in the bed on the top will be clipped through probably 3-4 times from when you plant to your last harvest so you will be replanting many times if you want to keep fresh greens coming. You also will be pulling your beans, onions, and radishes out eventually. Then you can fill the rest of this container with more onions, carrots, and beets so they can grow underground through the winter. They make for EXTRA tasty veggies come February or March. In the other box, your spinach and peas will disappear early as well. You can either continue planting more spinach or add in more kale. Kale is hardy so you can grow it even through a frost or two. I would also replace my tomatoes and peppers after their final bounty with carrots and beets as well. If you have limited space, I say pot your herbs. I love having easy and quick access to herbs to finish a salad or add to a dish quickly and without thought. So I love putting them in terra cotta pots near the kitchen. A few of these herbs will come back year after year such as the mint, thyme, and sage. I placed the basil on its own and you can even do a large cilantro pot as well if you use quite a bit. Basil and Cilantro will go to seed and die long about fall. You can replace them with new ones and bring them in before the first frost. I love having herbs inside through the winter. Right now, while you wait for the day to come to plant your garden, you will want to observe the spot you are going to place your beds. Most of these plants don’t want to be in full sun all day especially if you live in a warm climate so think about where you are placing them. If you do get full sun, you will want to rethink the veggies you are planting and stick to solely peppers, beans, tomatoes, and root veggies (but only later into the season). Some herbs do well in full sun all day as well so you may want to think through all of that. You will want to have easy access to water whether you run a hose from your home or you decide to use a watering can. No matter what you should have access. The best times to water are first thing in the morning and as the sun sets at night. Sometimes even running a light misting sprinkler through the night if it has been extremely hot and dry is a good idea. I am excited to hear about your garden plans. This will be what we will be setting up here for our friends, so you can of course follow our progress here and our Instagram, but I would love to know what other questions or thoughts you have as you are planning your garden this year! I would also love to hear what you want to see us talk about with our garden. This is going to be a large part of our blog moving forward as we move out to our land so we want to make sure we cover things you guys want to know more about. 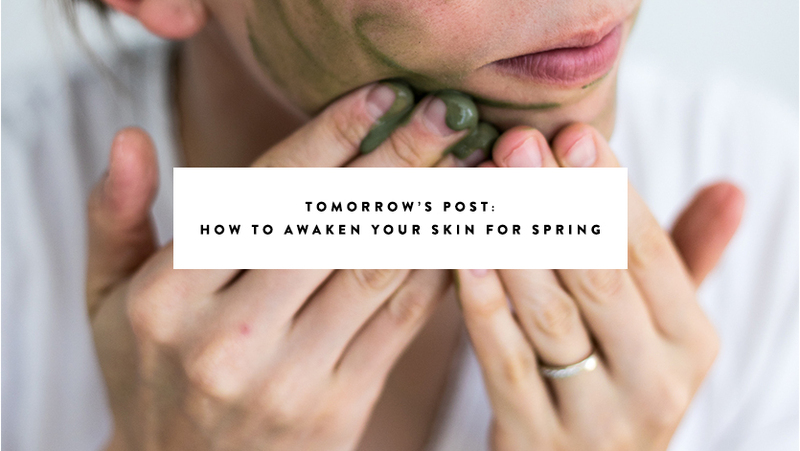 For tomorrow I will be sharing all the details on how I am prepping my skin for spring this year including the products and more. I bet you can guess that most of the products are all natural and back to the basics, can’t you? You know me well! See you tomorrow, friends! I love the way your blog is going! this is so timely! we’re in the beginning stages of creating our garden at our new home and have decided to go with raised beds (lack of grass/dirt in our concrete yard) and have been wary of how to get started. forwarding this on to my husband so we can get started! Excited to hear how it goes!!! Just wanted to say, I love your new blog dialogue. I can feel the passion. love love. I just ordered my seeds! I can’t wait for all this snow to melt so we can start cleaning up the beds and planting. Thanks for the tips…I definitely used your suggestions to plan our garden. I also added pumpkins, corn, and lots of flowers. Last year we had a problem with some of our veggies that flowered, but never produced fruit. I read that this could be because we didn’t have enough flowers in our garden to attract bees, so the plants weren’t properly pollenated. Hopefully this year all the extra flowers we’re planting will do the trick…! Oh interesting! I have always planted zinnias and then other wild flowers around the beds but only for aesthetics, but this makes sense. I love flowers in a garden so all the more reason now, huh?! Have a lot of fun! Thanks for the final kick in the pants to decide my hand at raised beds at my apartment this year! Have fun with it! That’s all that matters! love this post – thanks so much!! i just bought my seedling lights today and am ready for spring!! thanks for your helpful info – looking forward to more! Oh awesome!!! Yeah for gardening!!! Have fun! I am excited to see more of this on your blog. I love to garden and get my hands dirty but I mostly grow flowers and hydrangeas in my gardeN. We used to do a vegetAtable garden when we lived in the country and had more space and miss it. This is oNe topic I was really excited about with your new direction plan For the blog. The other topic is your gateherIngs! I love how beautiful they seem anD see hoW they Come TOGETHER Because Spending time with people you lOve gathered around the table is just the best! Happy gardening! Oh I am so glad! Girl you get it! So glad you are enjoying the new direction. It makes me so happy to hear this! I love getting to hear from / read from a fellow 6a gardener! I feel like there is never enough i can read about gardening in our zone! I can’t wait to hear about your experience. my husband and i are avid gardeners too, and have the pleasures of both raised bed gardens that are approx 2000 sq ft and a container patio garden (we can’t get enough). i love your plan and can’t wait to hear more about your experience working on the farm! i am so in love with the direction of your blog, get it girl, its fab. i might suggest one teeny tiny thing – perennial herbs like mint, thyme, oregano, sage, rosemary etc are best suited for (highly recommended to only be planted in) pots – if you put these in your raised bed garden they will take over (meaning it makes it very frustrating to crop rotate/try to plant something else). but they will contentedly live in pots for years and years to come! i also second isabelle, we plant our lettuces in our full-sun raised beds but do it behind the cucumbers (which are up on a trellis) and the cucumbers provide perfect cooling shade to our lettuces and prevent them from bolting. We also plant our peas and lettuces in early may/end of april weather depending because these types of vegetables can germinate in cold weather, plus then you get peas june/early july! I really enjoyed your post about gardening.I am going to try the raised beds with the cardboard, mulch, and soil.The trick will be to keep the bugs and birds away. If you are trying to stay organic or natural, I would suggest doing some research on natural pest control options especially with bugs. It will help a lot. Also, for the birds you can build frames to go over the beds that have metal fencing if it is a serious problem. There are some DIYs I have seen. I never had much issue with birds in the past more insects especially with tomatoes. Sometimes placing certain herbs nearby in your garden can deter these things as well. love how you start writing with a childhood memory! Love how you manage the writing style a lot! Anyway, thanks for sharing the tips! That’s what I’m looking for these days! Gonna try out soon!